HGTV Magazine features the interior design of Jessica Dauray Interiors in its May 2016 issue. Jessica Dauray Interiors becomes a member of the Southern Living Designer Network. Designers are always thinking about lighting when they tackle a remodeling project. We understand how important proper lighting is to the look and feel of the finished project. We also know that lighting can serve as a showpiece in itself. A beautiful chandelier can be the focal point of a room or the foundation of a cohesive room design. During a remodeling project, think about lighting early and often. One of the greatest mistakes we see homeowners make is treating lighting like an afterthought, leaving little in the budget. If you’re not sure where to start, follow our advice for choosing the best lighting for each room. Do you want the lighting to point up for a softer bounced light feel or down for direct light that may be great for tasks but comes with harder shadows? Lighting the ceiling can make a space look larger, while lighting the floor can make it look smaller, cozier or more intimate. Do you need task lighting? Whether this is a kitchen workspace, sewing nook or reading area, some spaces require special lighting considerations. When the space is designed for a certain task, you want to choose overhead lighting that points directly toward where the activity will take place, not diffused lighting or lighting that points upward. Do you want a statement piece? If the room could use a pop, consider a statement piece such as a bold chandelier or oversized pendant. However, if the room has a bold design or another statement piece, you probably want to go with something simpler and classic. Too many statement pieces can make a room look cluttered, overwhelmed and incohesive. What kind of mood do you want to set? Lighting sets a tone for the room. Generally, softer and more natural lights tend to flatter a room. In a bedroom or living room, consider opting for diffused lighting fixtures that flatter the space and the people inside it. In a kitchen or bathroom, of course, you’ll want brighter and more direct lighting. Keep in mind, too, that the best lighting comes in layers. You don’t want to rely solely on overhead lighting or chandeliers to light a room. The best-lit rooms have a mixture of task, decorative and accent lighting. They incorporate overhead lightings with lamps, picture lights and more. One final tip: Always pay attention to height when hanging light fixtures and chandeliers. If the lighting is too low, it will be in the way. If it is too high, it will not feel like a part of the room design, and it may be overlooked. If in doubt, reach out to a professional interior designer for the advice of an expert. They will be able to show you how to integrate the right lighting fixture with the style, color and size of your room. We touched on kitchen lighting above, but, again, the key is to layer. Kitchens need a mixture of overhead, task, and accent lighting. You might have recessed lighting on the ceiling above the countertops, softer pendant-style lighting or a chandelier above the island, and under-cabinet lights. Other beautiful and functional lighting options include mounted wall sconces, lighted glass-front cabinets, under countertop lighting to illuminate drawers, and toekick lights for ambiance and visual interest. The kitchen is one of the most complex rooms to light because you need to strike the right balance between functional and decorative lighting. If you’re not sure how to go about layering, we recommend consulting an interior designer or lighting professional for advice. Bedrooms are primarily for sleeping, of course, but a balance of lighting is important here, too. Soft light and ambiance are important in the bedroom to create a relaxing environment, but if the light is too soft or subtle, it will not be adequate for tasks like reading and dressing. Balance overhead lights with bedside lamps or sconces. Consider using a dimmer for overhead lights to control the ambiance. In general, opt for softer lighting but in many layers. When you’re shopping for bedroom lighting, pay attention to the size of the room and the ceiling height. You want the light to be scaled properly for the room, and it shouldn’t hang too low. Avoid putting overhead lighting directly over the bed. It can be uncomfortable on the eyes when lying down. And remember to think about the closet. Closets need to have good lighting so you can see the true color of your clothes. Interior design color trends are constantly changing, and it can be difficult to keep up. That’s why we, at Jessica Dauray Interiors, recommend modern and timeless over extremely trendy. However, that is not to say that you have to ignore trends altogether. There are ways to infuse color trends without committing yourself to a style that will look outdated in a few short years. Paint is most certainly one of them, as are bold accessories like accent pillows, throws, and rugs. These are great ways to update your space without a full redesign. Some of the color trends for 2015 are continuations of what we’ve seen in previous years, and others are fresh. While we’re not recommending you invest in an expensive item like a couch in one of these bolder hues, splashing these colors throughout will give your room a fresh and updated look. This Mediterranean-inspired hue is rich and vibrant. Think of the church rooftops on the Greek island of Santorini. This color adds a dramatic pop when paired when paired with neutrals like grey, white or cream. Bold 60s-inspired hues like olive and tangerine are back in fashion - in a big way. This is in line with a trend we’ve seen for several years toward the Mid-century modern style. You can pair a couple bold 60s colors together to add major pop to a room. The look is especially chic paired with wood furniture. Grey has been the neutral of choice for a few years now, eclipsing tans, beiges and browns in popularity. That trend is expected to continue. Some people are even calling grey the color of the decade. Sherwin-Williams has named its coral reef shade the official color of 2015. Coral pairs beautifully with neutrals like grey and white. Used sparingly for an accent wall or a pop of color on throw pillows or accessories, coral looks fresh and modern. This organic shade of green is back in fashion, and it is being used in unexpected ways - even for kitchen cabinets. Keep a light touch with this shade, however. If it’s overdone, the look can be dark and drab. We know what you’re thinking - it’s the 80s all over again. Not quite. The modern take on pastels is more Monet than Troop Beverly Hills. It is subtle, sophisticated and chic. Think pistachio, light pink and lavender. Anchor the look with plenty of neutrals for balance. This soothing, airy shade has made a resurgence in the past few years. It is easy on the eyes, and it promotes a relaxing atmosphere. It works in just about any room of the home, but it is especially great for bedrooms. If you’re sensing a theme, you’re correct. Ocean-inspired colors are huge for 2015. This color is cool and calming - a medium green with just a hint of mint color. Think of the color of the beaches in Ko Phi Phi, Thailand. The look is soothing but fresh. Even people who are not big fans of yellow gravitate to custard. It’s a darker, more muted shade of yellow, yet it still manages to feel bright and sunny. This color is great for creating an unexpected pop. Use it for breezy curtains, accent pillows or a decorative throw. Kitchens and bathrooms are the most expensive rooms of the home to remodel. You want the spaces to look fresh and modern, but you don’t want to choose materials that are too trendy and will go out of style. Some design trends, like granite counters and eco-friendly appliances, have staying power, while others are hot for a few years and then fall out of fashion. Kitchen and bath tile are one of the telltale signs of age in a kitchen or bathroom. Picture the bright pink and blue tiles of the 1960s or the ornatly patterned tiles of the 1980s. The make a home feel dated. To avoid regretting your decision in a couple years, follow these tips for choosing tile that won’t go out of style. While you don’t want the kitchen or bathroom to look drab, colorful and bold tiles - while trendy - are a risk. If you tire of the color in a few years or the shade goes out of style, you’ll have to either live with the tile or rip it out and start again. If you’re craving a pop of color, consider incorporating a row of accent tiles in the bathroom or using a colorful backsplash in the kitchen. Or, you can introduce color with paint or accessories instead. Generally, it is best to avoid tiling your entire kitchen or bathroom in a bold color. Subway tiles have been popular in bathroom and kitchen design for nearly a century. They are neutral and classic, but they also have character. Subway tiles are also easy to clean, which is imperative for kitchens and bathrooms. Patterned tile is far more likely to look dated in a few years than plain tile. However, that is not to say that you can’t choose a pattern if that’s what you like. They key is to find a pattern that is subtle, classic and understated. Think a subtle geometric pattern in a neutral shade such as light gray. Any style that is brand new can be a risk. There’s a balance here, naturally, because you want to design a space that looks fresh and modern. But it’s unwise to jump on the latest trend without knowing if it has staying power. Be wary of any tile trend that is brand new to the market or different from anything you’ve seen before. Sometimes these tiles are in vogue for just a season or two, then fall out of fashion. When in doubt, consult an interior designer to ask for an opinion on the whether the tile will look dated in a few years. Natural stone has proved its staying power. No other material has survived the test of time so well. If you’re looking for a safe choice that is also beautiful, natural stone, granite or marble is an excellent choice. You won’t regret the choice five or 10 years down the road. Dark tiles in shades of black, gray or brown are in fashion, and this is a trend that doesn’t appear to be going anywhere. Darker tiles look fresh and unexpected, but they’re still classic in style because they are neutrals. Tread lightly with dark tiles, however. 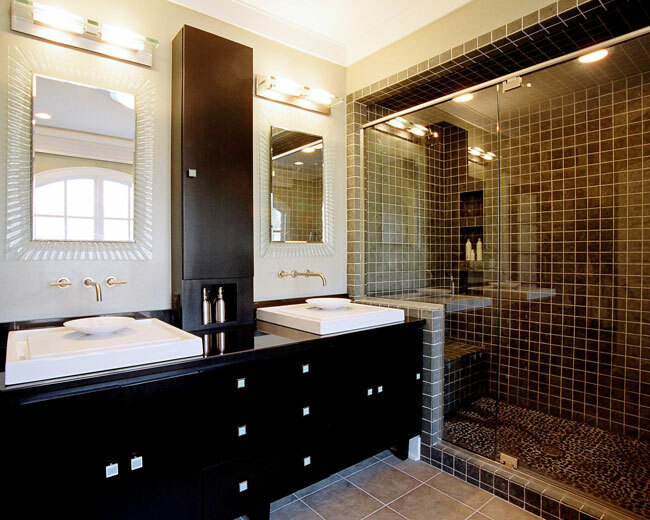 You don’t want to cover the entire bathroom in dark tiles - perhaps just one area such as the shower. And if your bathroom is very small, it is probably wise to avoid them altogether. The environment around us affects our mood, productivity, energy levels and attitude. Creating a beautiful space to call home is not just about impressing your guests and surrounding yourself with pretty items. It is about creating a space where you feel relaxed, comfortable, organized and at peace. A professional interior designer can truly improve your quality of life. Over the years, we’ve witnessed the positive changes design has brought to our clients. We hear all the time that our clients feel relaxed, peaceful, happy and harmonious in their new space. We’ve also seen design lead to other positive changes such as career opportunities. Sound to good to be true? 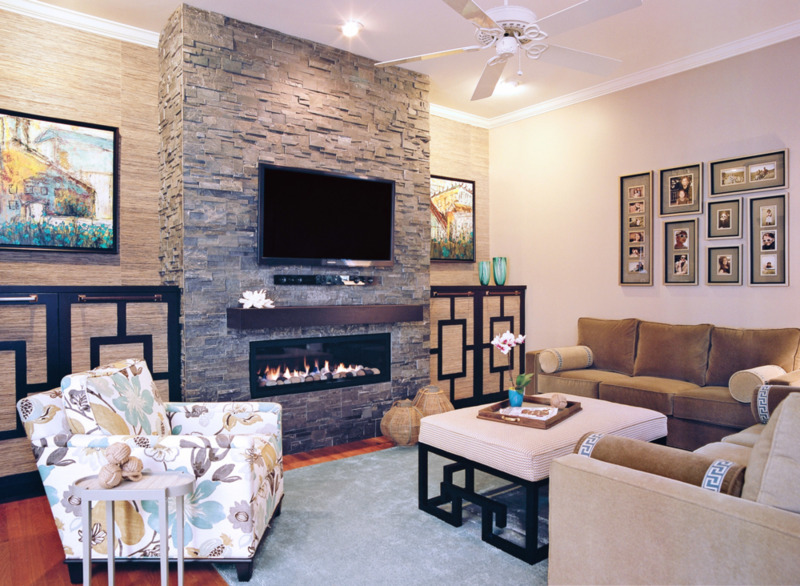 Consider these five ways an interior designer can improve your quality of life. From paint colors to lighting, interior designers are experts in choosing items that promote comfort and relaxation. Families and busy professionals need a space where they can unwind, but many people aren’t sure how to go about creating a restful and harmonious space. We consider everything from how the placement of furniture to the colors impact your space. A relaxing environment must be balanced, comfortable and properly proportioned. Designers do far more than create a beautiful space. We can also bring organization and order to your home. From creative storage solutions like custom built-ins to custom closet design, we can create a space where there is a place for everything. Having a home that is neat and well organized not only makes your home more comfortable and inviting; it also works as a stress reducer. We take the time to listen to your needs and priorities when it comes to storage and organization, then offer creative solutions for streamlining your life. Designers take the time to understand your lifestyle, then create a space that fits perfectly within that. Do you love to entertain? We can come up with creative and flexible seating options that allow you to accommodate extra people. Do you have a dining room you don’t use? We can transform that space into a stylish sitting room, an office or a combination of both. Designers know which questions to ask to understand how you live and what you need. Good design is not just beautiful; it is functional and suits your lifestyle. Designers also give considerable thought to creating a space that is healthy and safe. From eco-friendly appliances and sustainable materials to furniture that meets fire safety code requirements, designers are concerned with your well being, not just aesthetics. We consider health and safety throughout the design process, from beginning to end. Designers can also create a space with aging in mind, incorporating features such as wider doors, curbless showers and grab bars. Your home will be safer and more comfortable in the golden years. Designers create spaces that promote family time and togetherness, but they can also create individual spaces suited to each member of the family, whether it’s a play area for the kids or a reading nook for mom and dad. Some of our clients have also asked us to design special spaces for their pets, including dog washing stations and garages with heated floors. When each member of the home has personal space that is suited to them, everyone feels more comfortable. A home should never be designed around the needs and tastes of just one family member. It should appeal to everyone. Color choice is highly personal. Some people love bright and bold hues, while other people prefer more muted shades or neutrals. Most people instantly know what colors they like, but the more difficult part is putting together a complete and cohesive color scheme. Here are our tips for perfecting it. Most importantly, choose colors you love. Don’t worry too much about what is trendy. If you’ve never been a fan of purple, don’t choose lavender or grape just because they’re in vogue. You have to live in the space and you should love it, so the colors you choose should reflect your taste and style. If you’re at a loss for where to start, pick one light color, one dark color, and one bold hue. That combination always works. Think red, dark gray and light gray or teal, brown and cream. Colors that are opposite - or nearly opposite - each other on the color wheel work well together. Think teal and tangerine or purple and yellow. If you’re going to go bright, keep it to just two or three shades. If you go beyond that, the room starts to look cartoonish. Some colors and shades are more appropriate for certain rooms than others. You probably don’t want to paint the bedroom a bold red, as it does not promote a relaxing and soothing environment. Also, consider the size of your space. Dark colors are great for cozying up large spaces while light colors are great for making small spaces look larger and airy. First pick your color scheme for the largest and most centrally located room, and then work your way out. Often, this is the living room or kitchen. Once you’ve set the tone for the largest space to anchor the home, it’s easier to imagine what colors will work in the adjacent spaces. Resist the temptation to choose paint colors first and then find furniture and accessories to match. It is much easier to match your paint color to the fabrics in the home than vice versa. If you paint the walls first, you box yourself in to certain fabric colors, making the selection process more difficult. Never choose a color scheme with only one room in mind. Think about the flow of the home and how the colors will transition from one room to the next. You probably wouldn’t want paint a hallway olive green and the adjacent bedroom pale pink. Pay attention to which rooms are adjacent to one another. Lighting has a significant impact on how your color palette appears. If the room is low on natural light, avoid very dark colors. If the room is sunny and bright, you might want to avoid bold shades like yellow and orange or use them sparingly. Few people think about climate when they’re decorating, but it is an important consideration. If you live somewhere with a cloudy, cool or rainy climate, avoid using too many muted shades like gray. If you live somewhere warm, sunny and humid, keep the warmer hues to a minimum. Gather samples of fabrics and paints and examine them together to find out if your color scheme works. This is why designers create design boards. Even if you imagine that a color scheme will work, it’s possible to change your mind when you actually see the fabrics and colors together. Gathering samples helps you prevent expensive mistakes and avoid regrets.